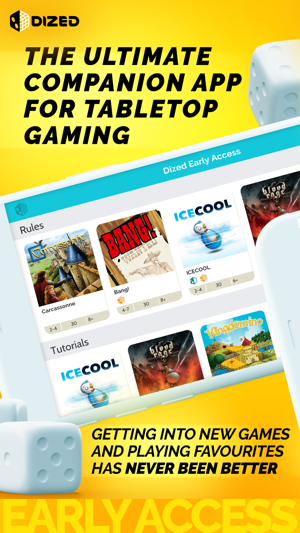 Dized app makes playing tabletop games a breeze! 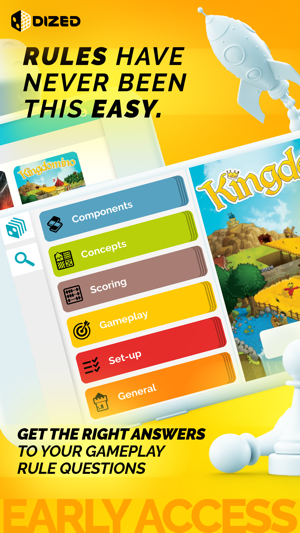 Currently it contains Rules and Tutorials, expanding into other digital content in the future. Rules are full game rules with built-in FAQs. They are publisher approved, searchable, cross-referenced and updateable, so you will never struggle with rule-related problems again! 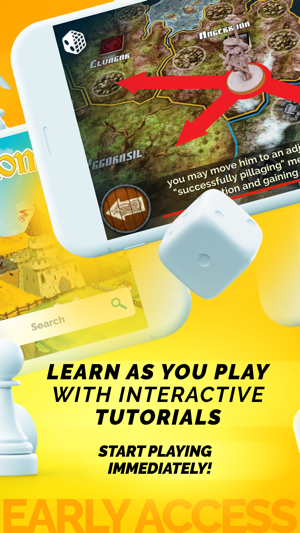 Tutorials teach you how to play games. It’s like having someone at the table teaching you the game while you play. 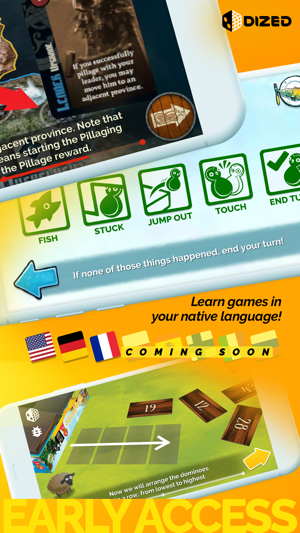 Dized Tutorials allow you to skip the rulebook and start the game immediately. This means you can fully focus on having fun with the new game! Learn more about the content at dized.com! I enjoy board gaming. My wife does not. It doesn’t help that I’m not very good at explaining rules. However, last night we played KINGDOMino for the first time, and instead of me bumbling through the directions, we pulled up Dized and just ran through the tutorial. It was animated, narrated, and even helped us calculate the score at the end of the game. Of course she beat me 45 to 25. I enjoy playing, and she wins. It’s just how it goes. Regardless, Dized will only continue to get better as they add more games and tutorials. Really looking forward to the future with this app. Great start to the app. Can’t wait to see more games added in the future. It’s super easy to learn how to play it’s nice not to need the rule book. I would like to see a tab just to help with scoring I really enjoyed that feature but once you know how to play it’s annoying to skip through the tutorial just to get to the scoring screen. Like I said though, so much promise for the future. Nice concept, all the rules are broken down into tabs. Animations going back and forth between tabs make browsing through rules a bit tedious. The placement of the back button seems a bit awkward. The number of game rules at the time of this review are extremely limited, but I’m sure that will change as time progresses. I’ll hopefully keep an eye on it and update my review as warranted.